Ask any teacher what they think about their regular staff development meetings and you’ll likely hear a course of groans. It’s not that teachers are opposed to professional development. In fact, most teachers would classify themselves as “life-long learners.” But those weekly face-to-face staff meetings are dreaded by many and loathed by the rest. Why is this? What should be done about it? Staff Development Meetings Take Away a Teacher’s Most Precious Resource – Time. Teachers value their own time above all else. Time is what allows teachers to plan great lessons, assess student products, organize their physical space, communicate with parents, etc. Sitting in a meeting takes away time that is sometimes better spent on other tasks. It forces teachers to take home more work in order to get everything done. Administrators should recognize that they are taking up teacher time and do their best to make every second of those staff meetings count. Not All Issues Need to Be Dealt With Face-to-Face. Certain logistical matters should not be brought up in staff meetings at all. Sending out a weekly email with important, need-to-know information, is a great substitute for taking up time at a staff meeting to relay this information. If teachers know that they are responsible for knowing and implementing whatever is in that weekly email, they will be able to read the email at a time that is convenient for them. Administrators should utilize email more often and eliminate the “nuts and bolts” from staff meetings unless absolutely necessary. Meetings Can Turn Into Gripe-Sessions. Teachers love to talk and feel passionately about what they believe. While it’s great to give teachers time to get things off of their chest, it takes time away from the actual “development” part of the meeting. Similarly, trying to come to a consensus with a group of teachers is extremely time-consuming. Think about how to eliminate some of these long conversations from taking up time during actual staff meetings. Could using a Google Survey help anonymously determine staff opinions? Are administrators able to follow an agenda and keep things on-track when passionate teachers get a little carried away? Administrators need to recognize when staff meetings get off-course and attempt to minimize this problem by thinking outside of the box. Emailing surveys are one way to approach this issue. Staff Development Meetings Aren’t Differentiated for Teacher Need. Not all teachers are at the same place in their professional development. Expecting a highly trained teacher to sit through the presentation of a curriculum they have been using successfully for years does not help that teacher move forward in his/her professional growth. What are the most effective and well-liked forms of staff development? Attending conferences and reading (or listening to) great articles/books/podcasts are two excellent forms of professional development that do not happen within the confines of a weekly staff meeting. Teachers are more likely to positively implement what they believe will be most useful to their students. Administrators should be flexible with what “staff-development” actually means. Give teachers choice and direction based on their particular needs instead of always expecting all staff members to develop at the same pace. 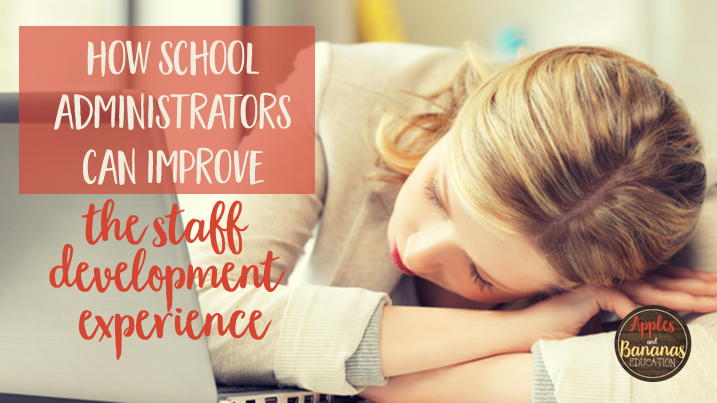 Staff Development Benefits Students, But Takes Away Their Classroom Time. Most schools now require their staff development to take place during the school day, which means that schools need to creatively adjust what their students are doing during these times. Some schools have specials/Wheel during this time where students receive classes in art, music, PE, technology, or other meaningful areas. Other schools have responded by shortening the school day for students, which can lead to a lot of issues (upset parents who now need to arrange transportation outside of regular school hours being one of these). The intention of staff development is that the skills teachers are learning will have a direct, positive impact on the students. Something else that has a direct, positive impact? Classroom time with a teacher! 2 hours of staff development per week equals 80 hours of classroom time. That’s over 11 days of instructional time. Ouch! Do the math. Is the staff-development you are doing benefiting students more than having teachers directly teaching them? Could modifying the staff-development schedule and format achieve the same (or better) results? Staff development is necessary. As teachers we need to be willing to learn new things and implement what we learn with our students. Administrators can help by making the most of staff development meetings and being flexible with how “staff development” is defined.